Note: The onion rings will cluster together in a heap when fried. You can pull them apart when you serve them! This recipe makes for some very crunchy and delicious rings! 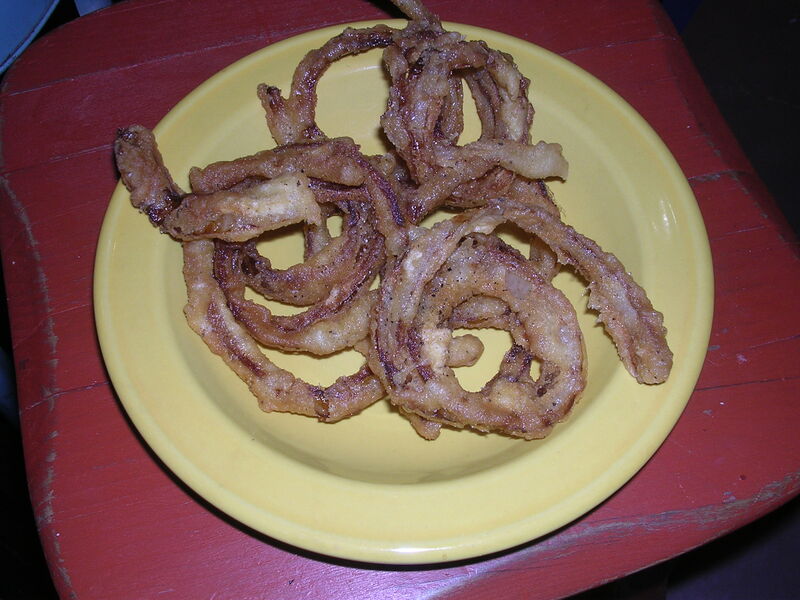 You can also use this batter to make the thick onion rings! In a large bowl, combine flour, soda water, and cayenne pepper. Mix with wooden spoon until smooth. Season with salt and pepper. If batter is too thick, add a bit more soda water. Using your hands, add a handful of onions to batter, coating each slice evenly. Add coated onions to the hot oil, frying until golden, about 6 minutes. Remove with tongs and drain on paper towels. Repeat with remaining onions. Cover with foil to keep warm while other onions are frying. Serve immediatly, sprinkled with salt and pepper, with bbq sauce or other condiment. We also like to use this batter for fried squash blossoms, which we first tried in a tiny, wonderful restaurant in Nice, France -- use the best salt you have to sprinkle on them after they come out of the frier!